As a younger man, I was something of an aficionado in the world of drinking games. Or, it might be more accurate to say, I was really good at drinking, games or not. Or, if we're being completely honest, I was drunk a lot, and sometimes we played games. If I can bounce this quarter and get it in that shot glass, you have to drink. Otherwise, I have to drink. We'll deal cards until someone gets a queen, and then that person has to come up with a category. The first person who can't name a thing in that category has to drink. Every time a TV reporter places unnecessary emphasis on a Hispanic name, we all drink. If you put a drink in my hand, I will drink it. I was especially good at the last one, but all of these drinking games shared a common characteristic - they were an entertaining way to get drunk. The best thing about a drinking game is that nobody actually loses - the goal of the game is to get drunk, and so the only loser is the guy sipping a glass of water. That dork has to drive us all home afterward. DrunkQuest is an attempt to reinvent the drinking game and make it actually competitive, instead of just a convenient way to become inebriated. Unlike most drinking games, which are open-ended and are only done after everyone stops playing, DrunkQuest invites players to try to level up their heroes before everyone else. DrunkQuest presents a fantasy game where monsters appear, and in order to defeat the monsters, players must drink. 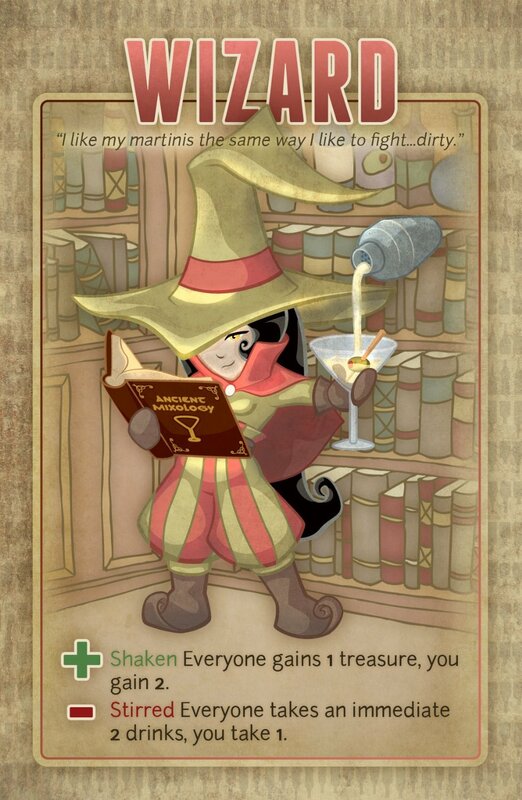 For example, a monster might require a player to take six drinks in order to kill it, and then the player would be awarded five treasure cards and a level. The first player to get six levels is the winner, and probably also the drunkest. However, there are a few considerations that make DrunkQuest slightly questionable as a drinking game. 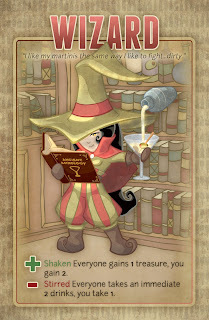 For starters, the treasure cards you can play on your turn have lots of words on them, and as anyone who has tried to program their iPad while blitzed can tell you, it is not easy to read when you're very drunk. At one party, I changed the same tape four times and still ended up listening to Joshua Tree every time because I couldn't tell if I was holding U2 or The Police (and yes, this was so long ago that we had tapes. And listened to U2.). For another thing, DrunkQuest has lots of stuff to track. You've got a realm ability that might let you drink less, and a hero ability that could add drinks to monsters your opponents have to fight. Some cards might specify that they affect other cards, but only specific kinds of cards, forcing you to re-read carefully and make sure you're playing correctly. Which is great when you're all sober, but not as awesome if you're trashed. If DrunkQuest were just a game that you didn't play while drinking, it would be on the light side. But I'm not sure I want to play a drinking game with four pages of rules, even four light pages of rules. If you can't sum up your game in a paragraph, I will be too besotted to comprehend it while in my cups. On the other hand, DrunkQuest actually tells us how much drink is in a drink, and says that a 12-oz beer has 24 drinks inside. That is not much drinking. Following these suggestions, we played a game of DrunkQuest, and at the end, one of us had consumed two beers, one had sipped his way through just one, and the last was kind of a girly-man who had managed to win the game after consuming less than half a beer. So sure, this might be a drinking game, but you're in more danger of having to urinate a lot than you are of being unable to drive. Play with hard liquor if you've got a tolerance, or if you want the art to get blurry before the game is over. Speaking of the art, it's very attractive. The cards are large, so you can handle them easily while intoxicated, and the pictures are simple and pleasing to the eye. Of course, if you decide to play this game with Johnny Walker Black instead of Pabst Blue Ribbon, you won't be able to see the art when the game ends, so that may be irrelevant. I could go either way on DrunkQuest. On the one hand, DrunkQuest doesn't get me drunk, and it's a little weak as a regular game. But then, it could also be a nice balancing point between normal games and the full-on drunk-express games I played in college. It's sort of unimportant what I think of DrunkQuest, personally. I'm a grown man now, and I only drink on two occasions any more. I like to have a nice imported stout when I'm eating a good meal, and I drink lots of whiskey on holidays so that I can tolerate family time. Other than that, I don't drink much, so DrunkQuest doesn't appeal to me, personally. I don't generally like being ripped, mostly because it just means I am about to take a nap. However, if you're younger than me (or just more prone to alcohol in general), you might get a real kick out of DrunkQuest. And if you might dig this game, you can also check out the expansion they're selling on Kickstarter right now. Personally, I can't think of a reason I need an expansion for a drinking game, but then, I don't play drinking games any more. If I did, this entire idea might make more sense to me.